Eileen Thurlow, an ardent devotee of spiritualism, persuades her uncle John to join her in a séance which produces the eerie sound of organ music. Later that same night John Thurlow disappears. A day later two bodies, one of them John Thurlow’s, are found in a field half a mile away. Victims of supernatural vengeance, a fatal duel… or base murder? Algernon Vereker, sojourning in the neighbourhood, is eager to investigate the mystery, however chilling its premise. He is joined by Inspector Heather of the Yard, and his trusty, high-spirited friend Ricky, to solve a crime which might send shivers up the spine of even a committed sceptic. 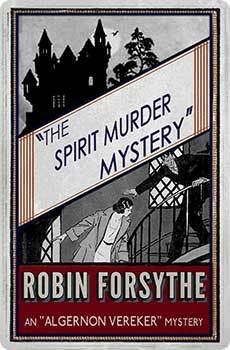 The Spirit Murder Mystery (1936) is another satisfying but merry mystery, the fifth and last of the Algernon Vereker novels. It includes a new introduction by crime fiction historian Curtis Evans.